To measure the function of frail elderly adults. The Elderly Mobility Scale (EMS) was developed in 1994 as part of an assessment package. It is a relatively simple outcome measure and is quick to administer. Frail elderly adults in hospital. The following is from the The Chartered Society of Physiotherapists and can be accessed here (includes instructions, form for recording scores and some simple interpretation of scores). See here for an online calculator for the EMS. 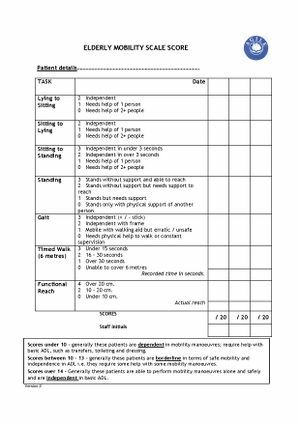 Scoring form for the Elderly Mobility Scale (used here with permission from AGILE, Chartered Society of Physiotherapy). Intra-rater reliability: No statistically significant differences in scoring by 15 physiotherapists. Content validity: The items of the test show a heirarchy of difficulty with "lie to sit" being the easiest task to perform and the functional reach being the most difficult task to perform. It has been proposed that the EMS measures two dimensions of mobility: bed mobility and functional mobility . Concurrent validity: EMS scores had highly significant correlations with both the Barthel and Functional Independence Measure (FIM) scores for 36 patients, age 70–93 years. (Spearman's rho for Barthel: 0.962, FIM: 0.948). A significant correlation between EMS and Barthel scores has been demonstrated in a second study (n=66, aged 66-69 years). A third study (n=32, aged >55 years) has demonstrated concurrent validity with the Modified Rivermead Mobility Index. Predictive validity: Is not conclusive. One study has shown that those discharged to home from hospital have higher EMS scores than those discharged to inpatient rehabilitation. Another study has demonstrated the use of EMS scores to classify residential care placements. Although results were limited by the study design (cross sectional rather than prospective), there appears there may be some useful cut off scores which could correlate level of mobility with type of residential care required. As the authors suggest, further research is required to confirm this. A third study found EMS scores showed no predictive validity for placement on discharge from hospital. In one study of 83 patients with a mean age of 79 in a clinical day hospital, researchers found the EMS was significantly more likely (p<0.001) to detect an improvement in mobility following a course of physiotherapy, compare to two other functional measures. The EMS has been shown to have a ceiling effect. A correction was published by Smith because of an error in the functional reach measurement in the original publication. See above for correct scale. Evidence for two different modifications to the EMS was published in 2006: the Modified Elderly Mobility Scale (MEMS) and the Swedish version of the Modified Elderly Mobility Scale (Swe M-EMS). The MEMS has added a stair climbing task to the EMS and increased the walk distance from six metres to 10 metres to minimise the ceiling effect. The Swe M-EMS was translated into Swedish from its original English and research shows a high inter-rater reliability and correlations with two other functional measures. Researchers found the EMS was limited in its sensitivity as a single measure to record improvement following an acute stroke. The Chartered Society of Physiotherapists provides an excellent manual for the use of the EMS, see here. ↑ 1.0 1.1 1.2 1.3 Smith R. Validation and reliability of the Elderly Mobility Scale. Physiotherapy. 1994; 80 (11): 744-747. ↑ 2.0 2.1 2.2 de Morton NA, Nolan J, O'Brien M, Thomas S, Govier A, Sherwell K, Harris B, Markham N. A head-to-head comparison of the de Morton Mobility Index (DEMMI) and Elderly Mobility Scale (EMS) in an older acute medical population. 2015. Disabil Rehabil, 37:20, 1881-1887. ↑ 3.0 3.1 3.2 3.3 Linder A, Winkvist L, Nilsson L, Sernert N. Evaluation of the Swedish version of the Modified Elderly Mobility Scale (Swe M-EMS) in patients with acute stroke. Clin Rehabil. 2006; 20 (7): 584-597. ↑ 4.0 4.1 4.2 Prosser L, Canby A. Further validation of the Elderly Mobility Scale for measurement of mobility of hospitalized elderly people. 1997. Clin Rehabil. 11; 338-343. ↑ 5.0 5.1 Nolan JS, Remilton LE, Green MM. The Reliability and Validity of the Elderly Mobility Scale in the Acute Hospital Setting. The Internet Journal of Allied Health Sciences and Practice. 2008; 6 (4):1-7. ↑ 6.0 6.1 6.2 Yu MSW, Chan CCH, Tsim RKM. Usefulness of the Elderly Mobility Scale for classifying residential placements. Clin Rehabil. 2007; 21(12): 1114–1120. ↑ Spilg EG, Martin BJ, Mitchell SL. A comparison of mobility assessments in a geriatric day hospital. Clin Rehabil. 2001; 15: 296-300. ↑ Chartered Society of Physiotherapists. EMS section of Outcome Measures manual Version 2. 2012. ↑ 9.0 9.1 Kuys SS, Brauer SG. Validation and reliability of the Modified Elderly Mobility Scale. Australas J Ageing. 2006; 25(3): 140-144.